Last year a friend of mine in another state participated in a “6×6” show. Each artist in the show produced 6 rows of 6 paintings, all 6×6 inches–36 paintings in total. I was intrigued by that idea, and since then I’ve brainstormed different ways I could put together a 6×6 series for one of the Lummi Island Artists’ Studio Tours. I’m happy to say an idea has finally evolved. Occasionally I paint a study–a small practice piece–before tackling a larger studio painting of the same subject. It’s a way for me to get familiar with the subject and figure out how to solve some of the problems I encounter before I start a larger painting. I really enjoy that process. Some months ago I was enchanted by the quality of light falling across a lone birch tree in a small clearing on Portage Island, which I can see out my living room window. I snapped a few reference photos of the clearing and the steep cliff below it. Occasionally I open the photos on my computer to play with different ways to compose the scene into a painting. 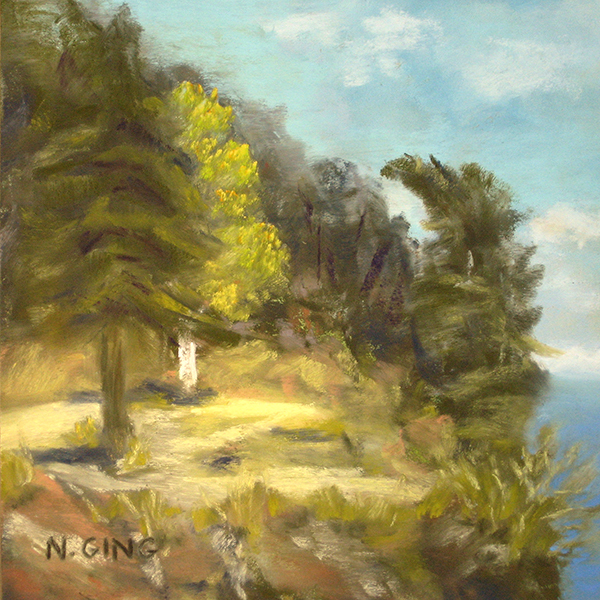 I’ve learned a lot about the subject, and have found many ways I’d like to experiment with the images using pastels. I’ve started creating 36 different variations of the Portage Island cliff view, all 6×6 inches, for the Lummi Island Artists’ Studio Tour. The next Tour is scheduled for Labor Day weekend. The painting at the top of this page is the first in the series. The second is shown below. I’m looking forward to seeing how the images change as the rest of the series develops! I hope you’ll plan to stop by and enjoy the final show! Be sure to sign up for my email newsletter to receive a timely reminders and details about upcoming Studio Tours. Thanks! Filed under Blog. 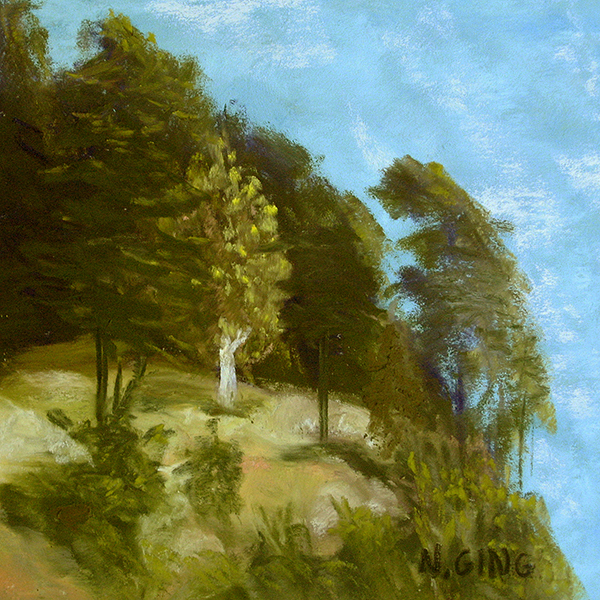 Tagged 6x6 series, Labor Day Studio Tour, landscapes, Lummi Island Artists' Studio Tours, pastel paintings, small wonders.